International Kissing Day was established in 2006 to focus on the kissing that takes place between lovers, and to celebrate the place it holds in our society. To celebrate, we rounded-up 26 cute AF Instagrams showcasing gay boys doing what we do best… lip locking! OK, not all the pics are actual lip locks. Some smooches are on the cheek. But these pics show that our love is visible, on social media and in real life. Speaking of gay kisses, remember that couple that went viral for recreating their kiss from more than 24 years ago? 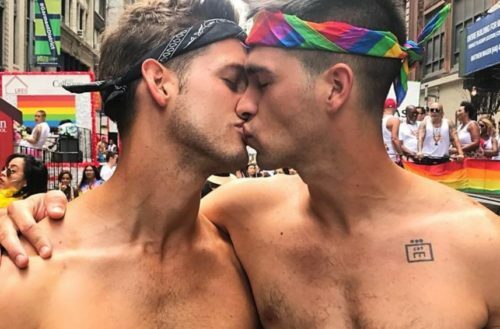 Kurt English and Nick Cardello, a married couple that have been together for 25 years, recently posted two images taken 24 years apart of them kissing. The photos went viral as an example of enduring gay love. A year after they started dating in 1992, they attended the March on Washington for Lesbian, Gay, and Bi Equal Rights and Liberation. While there, they took a picture of English affectionately kissing Cardello on the cheek while standing in the National Mall. The couple recently attended the Equality March for Unity and Pride in Washington D.C. and decided to recreate the photo. Next, they posted the two images side-by-side on social media where it eventually went viral. Hopefully, these adorable gay couples we feature below will be together in 24 years, too. We’d love to see their recreations for International Kissing Day 2041! How will you celebrate International Kissing Day?